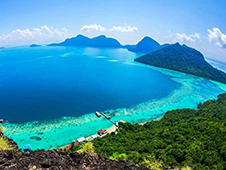 Langkawi – is the largest inhabited island of the same name and the archipelago, which includes 99 islands. Although in itself a small island, there is something to see: tourists expect beaches covered with volcanic black sand, clear to the bottom of the sea, the aquarium where you can see more than 5 000 thousand species of fish and marine animals. Langkawi has everything for your comfort and for business: the hotel can conduct business conferences and important meetings, and still operates here free trade zone, making frequent fairs. In Padang Matsirat, 20 km from the island's capital – Kuah, Langkawi International Airport. Here land the planes to European destinations and local airlines (such as Kuala Lumpur). The best way to get around Langkawi – car. You can rent it in the airport, as well as rolling offices of the island. If desired, the machine can be expected of you and in the port, if you arrive by ferry. Keep in mind that Malaysia is forbidden to transport on ferries leased cars. You can not use the rented car on the mainland for a ride on Langkawi. To advantageous to book a car in advance via the website, use bookingcar.ru. Rent a car can be a driver of 23 to 60 years old with his both national rights and the driver's license of international standard - one without the other is ineffective. We need to drive very carefully, as the roads are quite narrow, many cyclists and motorcyclists. Always pristegayte belt and talking on a cell phone with the hands - use a headset or speakerphone. The movement of the left hand side, do not forget about it - the edge of the road must be to the left of the machine. on the highway 120 km / h.
Fines for speeding rather big and the movement is usually slow, so you should not exceed the speed. The level of alcohol in the driver's blood should not exceed 0.3-0.5 ppm. As in many other countries, the offense while intoxicated pulls a more severe penalty in the form of higher fines. Incidentally, the amount can vary depending on what kind of mood was the traffic service. Learn about their fines, their amount and repay the receipt is possible only through the official website of the Department of Traffic Malaysia. Free parking spaces are usually there every hotel and restaurant, with them no problem. Pay attention to the availability of parking space before you shoot in a hotel room or apartment. Basically parking ground, underground parking lots almost never occur.